Recently a new variant of ZeroAccess/Sirefef trojan was shared on the kernelmode.info forum. Thanks to R136a1 (@TheEnergyStory) and EP_X0FF (@hFireF0X). The dropper sample uses an interesting technique to load the decrypted malicious payload in memory. We often see malwares storing an encrypted payload in the resource section. However, in this case it was interesting to see that the payload was encrypted inside a PNG image. In the call trace above we can see that the PNG image is accessed from the resource section, its width and height is calculated using APIs exported by gdiplus.dll and then loaded. The size of the memory to be allocated using NtAllocateVirtualMemory is calculated using image height and width. 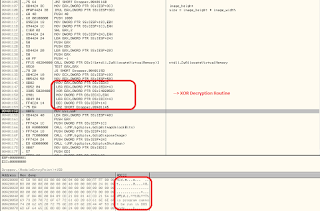 The decryption routine is a simple XOR decryption routine using a 4 byte key. Now comes the interesting part. The decrypted payload is loaded in memory as a legitimate DLL. In the case of ZeroAccess, it loads the decrypted payload in the memory as a legitimate DLL, shellstyle.dll. Let us look in depth at how it does that. 1. It first registers a vectored Exception Handler using RtlAddVectoredExceptionHandler. This vectored exception handler is set to be called before any other exception handler. 2. It sets the context of the thread with the Context flag set to 0x10010 which corresponds to CONTEXT_DEBUG_REGISTERS. So, based on this information we can now understand the different values set in the CONTEXT structure in screenshot above. 3. Now, the binary calls LdrLoadDll to load the legitimate system DLL, shellstyle.dll. When this DLL is being loaded into memory by the Operating System, it will internally call ZwMapViewOfSection. This results in triggering the hardware breakpoint which results in an exception that is caught by the previously registered Vectored Exception Handler. i) The exception code is compared with 0x80000004. This corresponds to single step exception which is triggered by the hardware breakpoint. 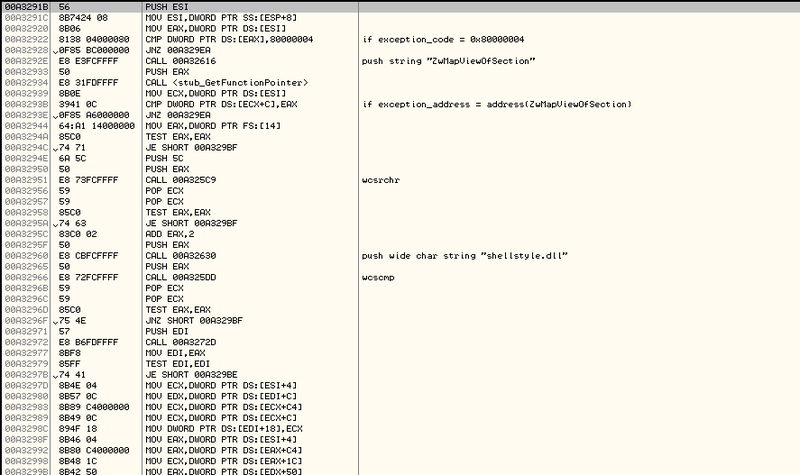 ii) It then compares the exception address with the address of ZwMapViewOfSection API. This is done to ensure that the exception was received from the intended source. iii) After these checks are performed, it proceeds to modify the structures specific to Exception to modify the return address. The return address is the value to which the control will be transferred when ZwContinue() is called. As a result of this, when the exception is handled and ZwContinue is called, the control is transferred to 0x00a3240a instead of 0x7c91bd03. 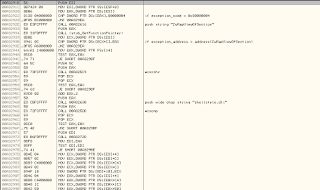 This way, the actual code of shellstyle.dll is not executed even though it is loaded in memory. After this, LdrUnloadDll is called to unload shellstyle.dll. 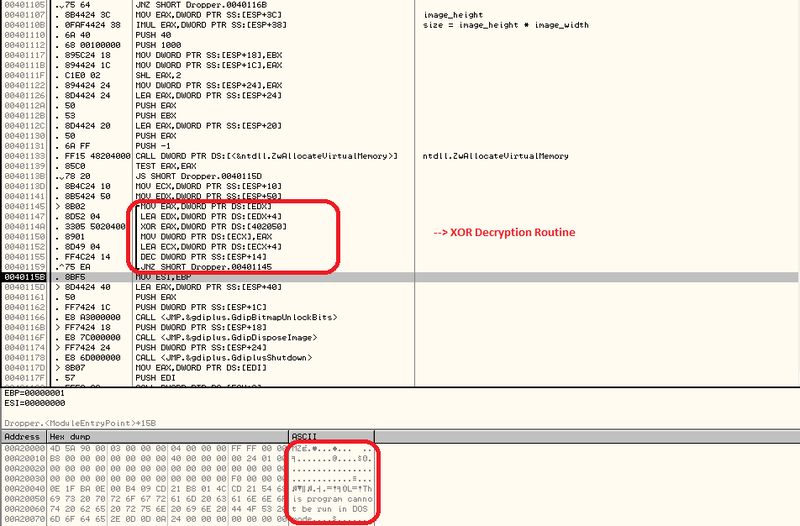 This technique of loading the malicious payload in memory in place of a legitimate DLL even though it appears as if the actual legitimate DLL was loaded is quite interesting. I need the sampe 650357c7517273946f044390bc6bb9da. Can you help me?